July 24, 2013, 6:17 PM · It’s time to put Connecticut on the map. 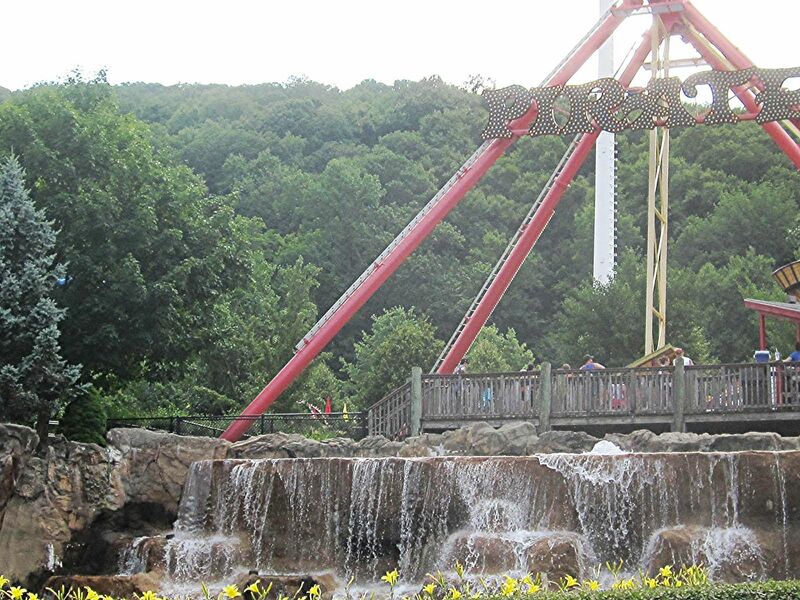 Located in Bristol, about a 40-minute drive from Hartford’s Bradley International Airport, Lake Compounce is a 332-acre theme park and water park featuring more than 50 rides and attractions. It’s also the home of Boulder Dash, a “mountain coaster” consistently ranked among the top-ten wooden coasters in the country. 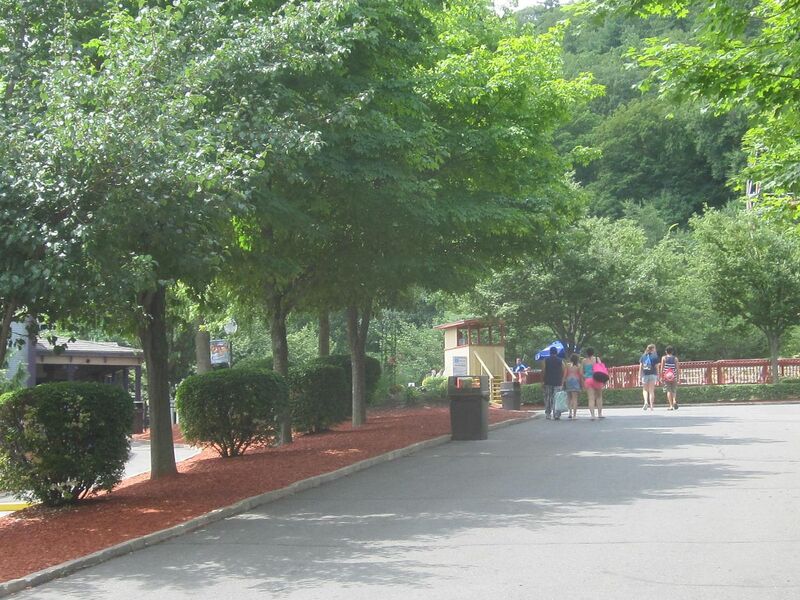 When I arrived at Lake Compounce shortly before opening time (11am), there was already a long line of cars waiting to enter the park. The cost of regular parking was only $8.00, a bargain considering that I had had to pay $20.00 to park at a theme park in Massachusetts on the previous day. The cost of admission was a bargain for me because I qualify for the senior rate of $19.99; regular admission is $38.99 but at the time of my writing this, there’s a limited time online special of $30.99. This is one of the advantages of visiting a theme park that’s somewhat off the beaten path and not owned by two of the biggest chains whose parks I regularly patronize. Lake Compounce is owned by Palace Entertainment, which owns half a dozen theme parks including Pittsburgh’s Kennywood, and a large number of water parks. Opened in 1942 1846, it’s the oldest and longest-running theme park in the country. After entering the park, I found my attention directed to the vintage wooden Wildcat coaster, operating since 1927 and still going strong. This is something of a focal point. Otherwise, I was struck by how nicely the park is laid out and by how well it uses its mountainous terrain. The creative use of the terrain is particularly evident on Boulder Dash. 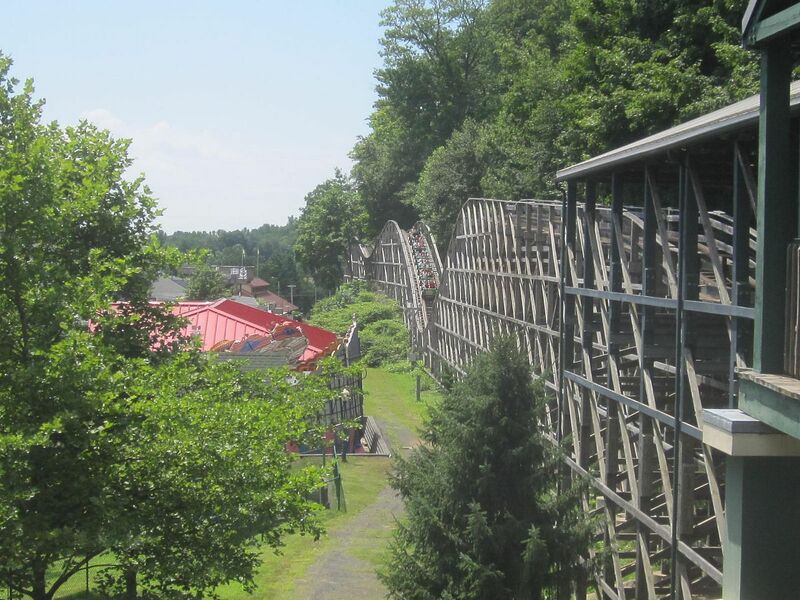 One of three coasters at Lake Compounce (the third being Zoomerang, a Vekoma boomerang), Boulder Dash is built into the side of a mountain, surrounded by trees and of course boulders. This coaster takes the riders on a wild ride through the woods on a 4,672-foot track with tree branches overhanging the track. Its reputation preceded it and it more than lived up to that reputation. I cannot remember the last time I had so much fun riding a roller coaster. Boulder Dash features one airtime hill after another, dashing along at 60mph with never a dull moment. The ejector airtime is insane and although this is not one of the biggest or most imposing wooden coasters in existence, in my opinion it’s one of the very best. Also worth mentioning is that the ride ops were outstanding not only in running the coaster efficiently but in interacting with riders to the extent of asking for a round of applause for first-time riders and birthday celebrants. The park kindly gave me permission to record an on-ride video but unfortunately, only the audio came out, no video, so that I now have four audio recordings of Boulder Dash. Sigh. There are so many other rides and attractions suitable for families and people of all ages that no-one is in danger of running out of things to do or see. Among the rides not previously mentioned are Thunder Rapids, Revolution (a spinning disk sending riders backwards and forwards to the top of each end of a steel track), drop tower and the obligatory Ferris wheel, to name just a few. Also of interest is a scenic lakeside water park featuring a number of attractions including but not limited to slides, rafts and a wave pool. One of the amenities provided by Lake Compounce is the drink stations, scattered through the park, where guests can get free unlimited soda. As one accustomed to being gouged at theme parks to the extent of having to pay almost $4.00 for a soda, I was delighted to be able to refresh myself at no additional cost. This is only the second theme park I’ve visited that offers free soda and on a hot, humid day it was really a blessing! Lake Compounce is one of the friendliest and most user-friendly theme parks I’ve ever visited. With Boulder Dash, great staff, nice ambience and on top of that free refreshments, what more could you ask for? July 24, 2013 at 8:26 PM · You certainly get around. That's how many parks so far this year? The park looks absolutely beautiful in the mountain like setting, especially the coaster along the hill's ridge. Before Kennywood/Sand Castle was purchased by Palace, Kennywood also owned Lake Compounce along with Idlewild Park, a children's park set in the mountains of western Pa. The sale netted Palace all three amusement parks plus the Sand Castle water park. You would probably enjoy Kennywood which has a number of unique coasters plus rides that no longer exist anywhere else. And it's on the historical registry.....Thanks again for a nice trip report on a park very few are familiar with. July 25, 2013 at 5:20 AM · Nice article, but two (2) corrections - LC was opened in 1846 and it holds the record as the longest continually-active amusement park in the USA. During the a period of financial uncertainty in 80's and 90's, the park did not operate on a full schedule. However, park fans volunteered their time and the park was only open over Labor Day weekend (generally) to continue it's record run. No rides, but a time to meet with others who share appreciation for this wonderful park. July 25, 2013 at 6:03 AM · I jut took the family over there, we really enjoyed the park. I really was not expecting for Boulder Dash to be so much fun! My only regret is not buying the season pass! July 25, 2013 at 6:34 AM · I had a chance to go to Lake Compounce a few years ago on a business trip to New Hampshire, but unfortunately passed it up in favor of Six Flags New England. 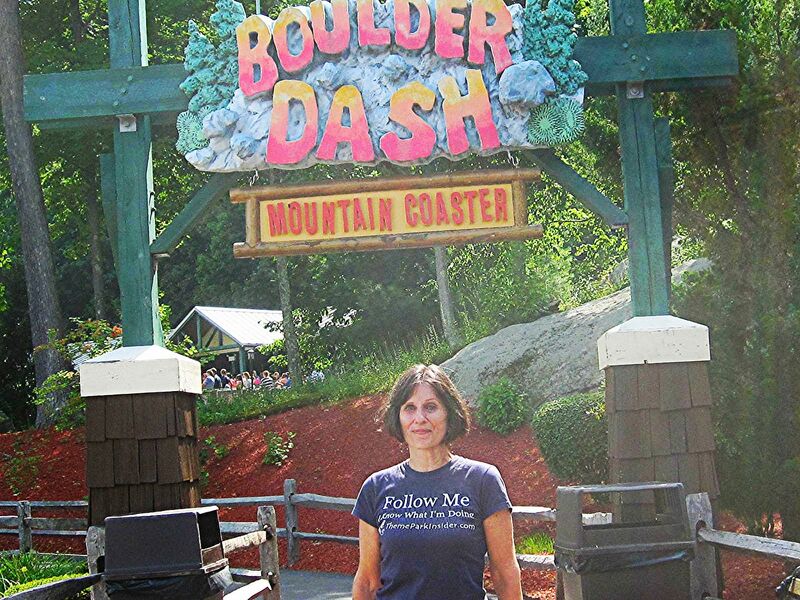 I have heard great things about Boulder Dash, but not much about the rest of the park, which is why I skipped it. It's interesting to see the free soda concept extend beyond Santa Claus, IN. It's definitely a perk that can separate smaller parks from the big chains, and in the grand scheme of things, soda is extremely cheap. If people knew how much a serving of soda actually cost a park or restaurant (typically 10 cents or less), they would NEVER buy a $4 non-refillable soda from a theme park. July 25, 2013 at 8:20 AM · I evidently made a typo or something went wrong while I was transmitting this article because I meant to say that it opened in 1846. Sorry about that because it looks sloppy and I did research this park before putting anything in writing. I also did say that LC was the oldest and longest running theme park in the country but this was edited. I've been to only 8 theme parks this year and 3 don't really count as trips because they're practically in my back yard. The farthest I ever got was Branson, MO. Lake Compounce is indeed beautiful and I felt confident that Boulder Dash alone would be worth the trip. A guy with whom I exchange emails hoped I wouldn't be disappointed because BD isn't as extreme as some coasters I've ridden, but a coaster doesn't have to drop 300 feet at an 80-degree angle to be great. If you happen to be in the Hartford area overnight, it makes sense to do Lake Compounce one day and Six Flags New England the other, as the two parks are roughly equidistant from the airport. That's exactly what I did although I'd been to SFNE before. 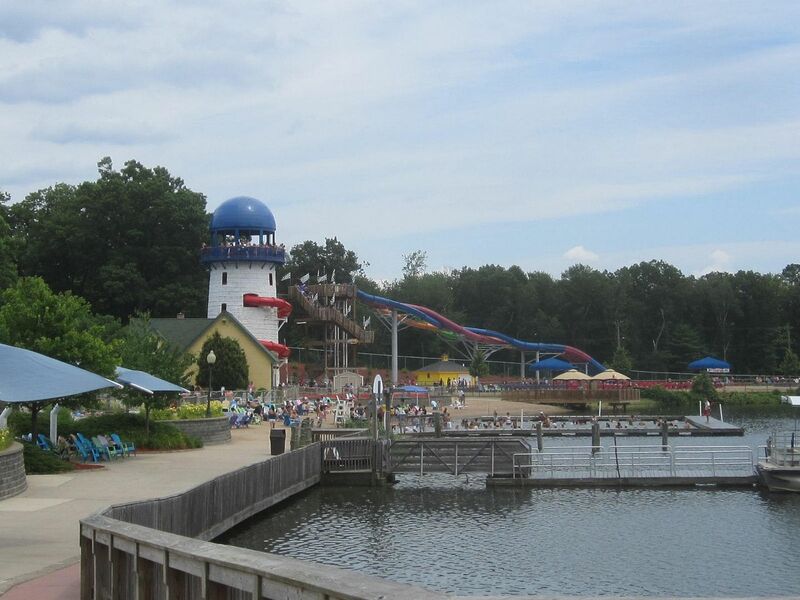 July 25, 2013 at 9:31 AM · I have been to Lake Compounce and it is a nice local's park. It reminds me of Cammobie Lake park in NH. Small local park but gives folks an enjoyable day. The problem here in New England is the weather. Theses parks can only be open seasonally..
July 25, 2013 at 8:51 PM · I fixed the opening date. I knew that 1940-whatever couldn't have been the oldest park, so I threw in the "one of the" qualifier. But, yeah, I should have known that Bobbie meant 1840-whatever on the year. My bad for not getting that edit right the first time.